2015 is starting out to be My Year of the Creepy Thriller. That’s not a bad thing; it’s always been one of my very favorite genres. It’s choosing to read them one after the other that isn’t my usual habit. I’ve always paced them, saving some of the really good, guaranteed to spook me books as treats for when my reading is flagging. Maybe starting my year with the film adaptation of Gone Girl set my reading mood? I only know it was unplanned. I’m far too scattered in my reading to plan anything. One of my favorite creepy thriller writers is Ruth Rendell/Barbara Vine, who unfortunately suffered a severe stroke in January of this year. Last I heard, not long after the announcement, she was in critical condition. I’ve heard no updates but it certainly didn’t sound reassuring. Writing as Ruth Rendell (her real name) her books were partially in the Chief Inspector Wexford mystery series and partially stand-alones. As Barbara Vine, she wrote thrillers (a separate genre, related to mystery) delving deeply into the minds of psychotic killers. In the thriller, the reader knows who the killer is, waiting to see how things unfold, how the person is caught or not, learning more about the depravity of the crime as the plot proceeds. And Barbara Vine is a master of the deep and dark, morbidly fanciful thriller. She’s in her own class. 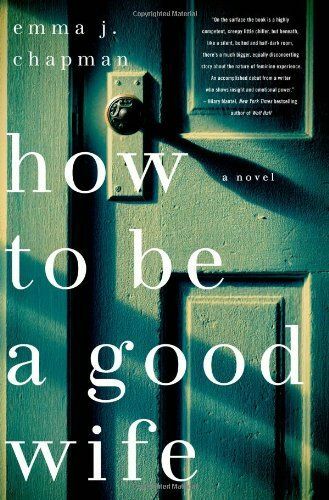 Then there’s How to Be a Good Wife, a novel that’s somewhat muddled between thriller and mystery. In the beginning, the reader knows something is most definitely off. Marta and her husband, a long-married couple, with one grown son engaged to be married, live in an unidentified area of Scandinavia. Marta is deeply disturbed, her husband, to all appearances, a caring man who never loses patience with her. Outwardly, he could be perceived as saintly. He also makes her pop pills, to keep her hallucinations and nightmares at bay. What makes the reader suspicious is Marta’s own doubt, the fact she’s distrustful either of her husband or doctor – whom she doesn’t recall even seeing, ever – or both. Instead of taking the medication she pretends to, rolling the pills under her tongue, spitting them out when her husband’s out of sight. This shows a degree of sanity, a realization what she’s doing and why. Without the medication she’s still quite mentally unbalanced but at least she begins to remember things from her past, vague images that grow more sharp as the book progresses. This is why she stops, because she is starting to see something real, occasionally, in the kaleidoscopic unreality of her mental state on drugs. She’s seeing it and she recognizes its difference from pure hallucination. Based on that, the book sounds great, doesn’t it? A disturbed woman beginning to wake up, recalling the source of her unstable mind, learning whom she can trust and whom she can’t. And her own husband is at the top of the suspect list. IN THE TRADITION OF EMMA DONOGHUE’S ROOM AND S.J. WATSON’S BEFORE I GO TO SLEEP, HOW TO BE A GOOD WIFE BY EMMA CHAPMAN IS A HAUNTING LITERARY DEBUT ABOUT A WOMAN WHO BEGINS HAVING VISIONS THAT MAKE HER QUESTION EVERYTHING SHE KNOWS. This hits it right on the head: it’s a mix of the two novels. A perfect mix, as in, a bit too close. It’s true no one can patent an idea. It’s also true if a reader has read the two books mentioned it’s going to seem awfully familiar. Guess who has read these two books? Yup, this gal. It left me wondering what, exactly, her editor was thinking, accepting a book so closely related to two other very high profile books. I expect it was their popularity, the amount of money they raked in, that turned the publisher’s head. I don’t begrudge them the business; I am upset by the questionable ethics of publishing a book that’s been done before. Not just before but within the last few years. Putting aside the doppleganger plot, the style Chapman chose is abstract, sometimes irritatingly so. I’m a patient reader, who loves dense prose, but only when it moves at a pace that isn’t glacial, or is so superb I don’t mind following at a slower pace. When it’s genius, I mean. At times I found Chapman’s writing too self-consciously obscure, too artsy for artsy’s sake, without advancing the plot. More concrete information wouldn’t have hurt the story line one bit – something, anything to give the reader something to grab onto, a chance in hell of finding a reference point. Instead, we’re made seasick by the constant inconsistency. Constant inconsistency: that’s an odd phrase for you. I’m leaving it, though, because it fits. Still, I’d be lying if I said I didn’t swallow this book in a gulp. I read it in the course of a day, letting the house and all my other plans go straight to hell. Overlooking the occasionally almost impenetrable prose, I had to know how it ended.